Imagine an area the size of a small city centre, bristling with buildings set in beautiful gardens; fill the buildings with every type of commodity and activity, in the largest possible quantities; invite all nations on earth to take part, sparing no expense. After six months, raze this city to the ground and leave nothing behind, save a number of landmarks intended to survive and to go on to serve a new purpose. The World’s Fairs, held since 1851, were occurrences such as these, spectacular gestures which briefly held the world s attention before disappearing. Millions of visitors strolled through the sites, urban centres were re-planned to accommodate them, national economies were damaged, fortunes made and international hostilities postponed. In Paul Greenhalgh s beautifully illustrated book some forty expositions are dealt with in detail and many more are described. From America, Britain and France key countries in forming the exhibition tradition to Amsterdam, Antwerp, Barcelona, Brussels, Dublin, Montreal, Moscow, Osaka, Shanghai, Vienna and Turin. 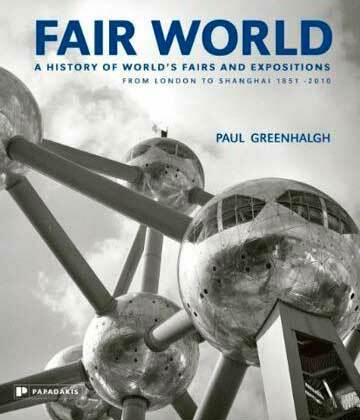 Fair World enlightens the reader on the fairs key periods in history including the belle epoch between 1875 and 1915 the golden age of exhibitions where over fifty major expos were held and the age of Futuropolis from 1925 to 1970. About the Author Paul Greenhalgh is Director of the Sainsbury Centre for the Visual Arts at the University of East Anglia. His former roles include Director and President of the Corcoran Gallery of Art in Washington DC, President of NSCAD University in Canada, and Head of Research at the V&A Museum in London. Text: Greenhalgh Paul. pp. 300; hardcover. Publisher: Papadakis, Winterbourne, 2011.